“This gave me hope again, I believe I can make things and solve problems,” said a 17 year-old Afghani boy after completing the MIT D-Lab Creative Capacity Building training in Athens, Greece at the beginning of August. ke things and solve problems,” said a 17 year-old Afghani boy after completing the MIT D-Lab Creative Capacity Building training in Athens, Greece at the beginning of August. 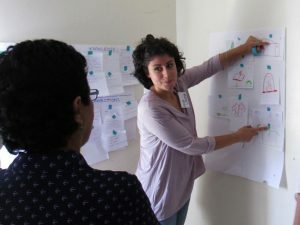 For the last two years, we have been telling anyone who will listen (and some who don’t) that design training would be a powerful transformation tool for refugees, but our experience this August, leading a design training with a group of underage refugees in Athens, proved more powerful than we had imagined. A team of six D-Lab staff members and students led a week-long Creative Capacity Building (CCB) workshop from August 3-9th for a group of unaccompanied refugee minors. Having left their countries because of armed conflict, they are now alone in Greece without parents, several are orphaned, and they face huge challenges seeking asylum in Europe. And although we originally thought that income generation would be our major impact, we learned that the most important impact was that they could recover an identity that moved beyond that of refugee, they could see themselves in a new way: as makers and innovators. Martha: There are 2,300 unaccompanied refugee minors in Greece, almost all boys between the ages of 12 and 17, from Afghanistan, Pakistan, Syria, Iraq, Iran, and Eritrea. They are stranded and alone in Greece with no real solution to their limbo, caught up in the often inexplicably cruel bureaucratic gears of asylum and immigration policy. Most joined the massive refugee push into Europe in 2015 and 2016, but when the borders closed, they ended up trapped in a situation that didn’t have clear pathways for the future they had hoped for. As minors, they can apply for family reunification if they have family members in other countries in Europe and many have done so. However, the bureaucracy in both the host country of Greece and the receiving countries in other parts of Europe can take over two years and the teens remain in limbo. If the youth turns 18 during that time, he is no longer a minor and is no longer eligible to join his family. Until the fall of 2016, these boys passed under the radar of the humanitarian organizations, they lived on the streets in Athens and other cities, doing what they could to get by, suffering all kinds of exploitation. Now there are shelters for about 1,300 of them but the rest are still living in dubious, often unsafe circumstances. Finding a solution for 2,300 teens who are unaccompanied minors should be possible, we are not talking about tens of thousands but still there is no solution on the table for them. Most cannot go back to where they came from and now they cannot go forward on their journey. This leaves these boys in limbo, biding time in Greece, some waiting for family reunification, others just waiting hopefully for some solution to their situation. Beyond the statistics of refugees in Greece, each of these boys has a story of trauma and resilience, but those stories get lost in the morass of international immigration and resettlement bureaucracy. When others see you primarily as a refugee, you are not seen as an individual, particularly one progressing towards a future. Being seen as part of a “vulnerable population” is even more disempowering. The CCB workshop changed that for these youth. It created a space where these smart, motivated young men could be just that: intelligent people learning useful skills, not refugees, not traumatized youth but smart kids with a lot of potential. Amy: A group of 14 teens came from different shelters and camps in and around Athens, traveling for up to an hour and a half in the intense August heat to get to the training site. They spent the first three days learning the design process and gaining hands-on skills through a variety of projects and activities and during the second three days, applied the process to a project of their own choice. Their first project was to build a hand-held hot wire foam cutter which taught some basic woodworking, metal working and electronics. They used the cutter to make patterns which they then learned how to cast in aluminum at the small foundry we cobbled together in the sub-basement. The next project was originally going to be a tool box that they could put their tools and projects in. We had thought that it might be nice for them to be able to lock it, as few of them have a way to secure their belongings. As we were working with the youth, we realized that we wanted to give them more control over what they created, so we made it more open—they could design any kind of locking box that they wanted. Each one of them was given two pieces of wood, a meter-long piece of 1” x 6” and a meter-long piece of 1” x 4”. They were given hinges, hasps and a lock, and the rest was up to them. Because their supply of wood was limited, we encouraged them to make cardboard models of the box before starting. Then we taught them the basics of sawing, drilling, and fastening and they got to work making the real thing. The variety of boxes was incredible. Every one was unique and contained a little of the heart and soul of its maker. One of the youth made a box that was a replica of a box that his grandmother used to keep treats in for him when he came to visit. Another took advantage of a knot hole in the wood, and had a charging port for his cell phone. One of the youth who loved to work on science projects built a box for his electronics tools, and designed it so that when you slid open the doors, two small LEDs turned on and lit up the inside. Another took on the challenge of making a triangular box, without the benefit of a miter box to make the angled cuts. It was a real testament to his perseverance that he finished his box without reverting to the classic rectangular shape. As they painted their boxes, even more of themselves came to the surface; one of the younger boys painted the mountains of home and the name of his little brother on his box. Others displayed their pride in and love of their home countries by painting Afghani or Syrian flags. Some looked to the future by painting the flags of countries they wanted to go to. It was amazing how such a simple activity could lead to such a wealth of self-expression. For the second part of the training, the youth had a chance to choose their own design projects to work on. Some chose things that would be useful in the camp, solar-powered fans and a solar-powered water cooler. Another group chose to address a problem their family faced at home, building a model for a solar-powered irrigation system that could store and release water to irrigate terraces of fruit trees on the hillsides of Afghanistan. They worked in teams of three or four, alongside one of the D-Lab facilitators. Martha and I were joined by three wonderful D-Lab students (Molly and Zoe from the Humanitarian Innovation class, and Jana from the Design class) and our amazing translator, Asif, who is one of D-Lab’s financial administrators for his “day job”. The youth made friends across language barriers, taught each other what they knew, and built upon each other’s ideas to improve their designs. They drew from the skills that they learned during the first part of the week, and gained a lot of new skills. They came early every day and left late every afternoon and made sure to clean the work space and leave it spotless and organized. They expanded into a space where they could prove what they were capable of. Waiting to move on to permanent settlement or for asylum, they feel their lives are being frittered away and they are falling farther and farther behind. This design workshop reversed that feeling; they felt that they were moving ahead. Martha: When we started planning this CCB workshop, one goal was to provide the youth with skills to invent and make things that they could eventually sell so that they could earn income. Another goal was to improve their self-esteem and help them realize their creative potential. What the youth taught us was just how important that second goal was for their own development. They are hungry for knowledge and new skills to improve their lives and are deeply motivated to learn and demonstrate what they are capable of doing. They so badly want an opportunity to grow. Amy: The final showcase was a highlight of the week, a moment of great energy and enthusiasm, but it was critical that the youth understood they could continue working on their designs, learn new skills and make more useful things after the training was over and that this feeling of achievement was not transitory. We are pleased that Zoe, a recnt D-Lab graduate and one of the design facilitators for the workshop, has volunteered to stay on for the next three months in Athens to provide design mentoring for the youth and to run additional classes in science, technology, innovation and engineering. D-Lab is working with two partners in Athens to facilitate Zoe’s work, Faros, a Greek NGO that works with unaccompanied minors and does outreach across different networks to engage youth in educational activities and The Cube Athens, a collaborative workspace and start-up incubator that has a maker space that let us use their building for the training, Both organizations have welcomed Zoe to use their space for on-going work and encourage the youth to continue using their resources, and even to bring along their friends. The Cube will host a mini-maker fair in Athens in October where the youth can present their refined prototypes and any other projects that they have developed. We have exciting visions for collaborating with these partners to build upon this work and open a vocational training and innovation center in Athens. Our hope is to open the center to local youth from Athens as well the unaccompanied minors and other refugees in order to give the groups a chance to get to know each other and integrate with each other. We would love to bring more D-Lab students there to do other design trainings, and hope to incorporate this into our Humanitarian Innovation class next spring. In addition, we are in discussions with another group to develop a mobile workshop to do CCB trainings in other camps in Greece. Although our resources are still scarce, we know that we need to continue to move this work forward. These smart, motivated, committed young men are getting air-brushed out of the picture of refugees in Europe and left to languish. They deserve better. We must keep faith with them, and help create opportunities for them to become who they dream of being … and it is a lot more than just a refugee. This project seeks to bring together a group of GBV experts, designers and humanitarian workers to develop a customizable GBV-focused curriculum that engages refugees in the design process, and a plan for the roll-out of a pilot program that uses this curriculum as a means of preventing and reducing gender-based violence. One of the fundamental principles of Rethink Relief is that innovation thrives when you bring together people from different disciplines and backgrounds, so we put this principle into action as we began our HIF-supported project: Addressing GBV through refugee-led innovation. We brought together twenty-two people for the three-day kick-off meeting in Entebbe, Uganda. We invited people from different backgrounds, different disciplines, different organizations, different economic and educational levels, different sectors and different countries; people that usually don’t work together: GBV experts, designers, ICT experts, teachers, students and refugees. At the beginning, it felt like we were speaking different languages; but as time went on, and we went through a variety of hands-on exercises and co-creation activities, the group started to gel, we got on the same wave length and the ideas started to flow. 3) have designers, refugees and GBV workers share their experiences and learn from each other. Since co-creation is at the core of our approach, we could not imagine developing this pilot program and curriculum without first getting a variety of stakeholders and experts in the same room and make sure everyone’s voice was heard. We had a chance to hear from different experts about their work in the field and their techniques to address gender-based violence in different parts of the world: Carolina from Oxfam America introduced us to the challenges of urban-dwelling gender-based violence in El Salvador, Annet talked about findings from the monitoring of her work in South Sudan with IRC, Marina from UNHCR in Geneva talked about their SGBV prevention measures while Jal and Gift from Rhino Camp in Uganda shared insights through their perspective on youth outreach and GBV programs. Amen, Sally and Stephen all shared their experiences in facilitating Creative Capacity Building workshops and showcased many innovations that were designed and build by local technology groups. • Curriculum: to develop a GBV-focused curriculum that engages refugees in the design process and can be adapted for use in multiple contexts. • Monitoring and evaluation: to create a novel monitoring and evaluation framework that builds on the principles of participatory evaluation and Lean Research. At the end of the three days, we felt we could say the meeting was a success, not only because the participants had a great time working together but also because they mentioned they learned a lot and gained new perspectives that they will integrate into their ongoing work. A core group from each of working group got together to consolidate the good thinking during those few days, into a framework for developing the deliverables for the project. We are happy with the material developed in such a short time period, but even more importantly, we are excited by the strong core team that has emerged to move the project forward, and the enthusiasm from all partners to continue our work together on this very important topic. The different teams took this mantra and ran with it! 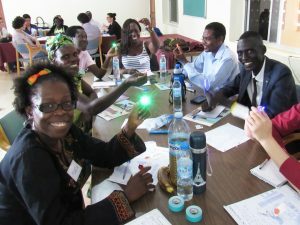 As the Lighting team, my team and I used the “woohoo” approach to tackle the lighting issue faced by the residents of Ayilo refugee camp in Northern Uganda and other refugee camps across the world. The team was a multidisciplinary team comprised of mechanical engineers, a product designer, residents of Ayilo camp, a machinist, a teacher, a social entrepreneur, and a student. 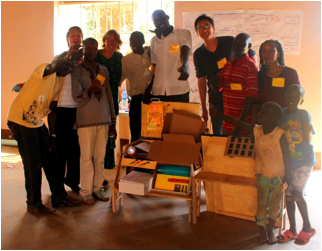 Members of Light Team (L-R): Lual, Jen, Mensah, Thomas, Clarence, JY, Daniel, Marian, and featuring children from Pader. Suitable lighting is a necessity that many humanitarian organizations tend to overlook in relief situations. But think about it: how important is light in your life and in your day-to-day activities? Now imagine a life filled with darkness. A life with limited movement because you are afraid that you may be attacked on your way to the nearby latrine, a life whereby you have to close your workshop early when evening falls, a life whereby you struggle to study for your exams because your home has no light. 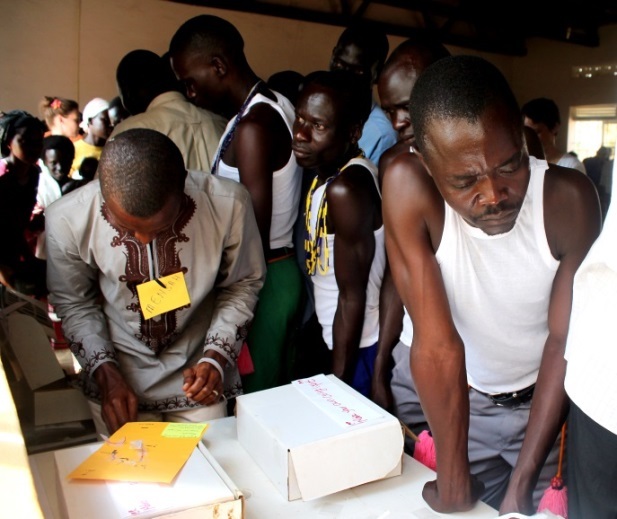 It is tough for many to imagine such a life, but that is the norm for many in Ayilo camp. Due to those and many other reasons, the light team was determined to find a solution. After days of brainstorming, illustrating a value chain, developing a sketch model, and finally building a prototype, WE Light was born. The name WE Light was agreed upon to show that the product was for any user and for the community as a whole. Make Your Own Light: This kit has the basic components to make a light, including an LED, battery, connector wires, and resistors. The kit also includes various accessories like housing to complete the user’s design. Make Your Own Business: The kit includes all the light components found in the Make Your Own Light kit, but in bulk supply. Also included in the kit are user manuals and a text book in both English and Acholi. This is to enable the user to gain the skills needed to start a fully functional light manufacturing business. The books give the user both technical and entrepreneurial skills needed to make their business both profitable and sustainable nike sneakers air max. This information would also be available in video format on microSD cards that could be played on a mobile phone when literacy is a challenge. Make Your Own Ceiling/Wall Light: This kit is specifically used to make 2 types of light: a ceiling light and wall light. The overall packing is labeled the Relief Box. Once deconstructed each component of the Relief Box can be easily assembled to make a complete workstation. 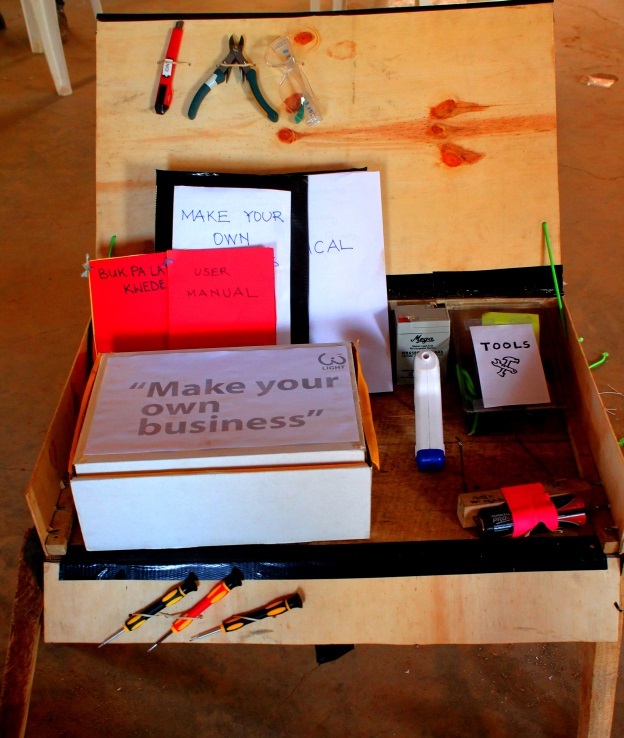 Inside the Relief Box is another box which houses the Make Your Own Business kit. The housing of the Make Your Own Business kit also has the capability of transforming into a portable functional table. Designing and fabricating this kit did not come without its challenges, but as a team we were able to work through them and accomplish the intended goal. First, the design process from ideation to fabrication was restricted to a week, therefore each day had predefined objectives that had to be met and it was crucial they were achieved. Due to this, some days were spent working extremely late into the night. Secondly, our value chain underwent several iterations before settling on our final one. The value chain had to be practical and well-defined. We needed to visualize and determine step by step each node of the value chain from sourcing of the various components of the kits to their various end users. This required the team to understand the typical humanitarian relief processes and procedures, basics of supply chain and also life within Ayilo camp. Lastly, it was initially a challenge to fully define the different kits and their function. Our objective was to make the number of kits as few as possible but to ensure that the contents of the kits were sufficient enough to deliver on their intended purposes wholesale nike air max. Complexity would only make it harder for the user to understand and deter them from their use. With this innovation, it is my hope that we can bridge the gap between short term-humanitarian relief and long-term development. The conference and working with all the members of my team was such a fulfilling experience that I will cherish. My most memorable moment was showcasing the kit to the people of Pader. Their enthusiasm for the kit as well as their eagerness to learn more about the product was validation for the team on the incredible work we had put in to make the project a success. To all the organizers and the participants: Apwoyo Matek! The cooking team wanted to reduce the risks that women in camps face when going out to collect firewood by decreasing the amount of fuel needed for cooking. Many energy-saving cookers have been introduced, but few have been accepted. The refugee and community participants explained that women often rejected cooking devices that looked different from traditional stoves. The team designed a familiar-looking mud Lorena stove that had an insulated, fireless cooker incorporated into it nike air max 90 premium. The initial reactions to the design were very positive, and the local members of the team plan on building full-sized prototypes to test at their homes. Shortage of clean drinking water is quite common in refugee/IDP camps in Uganda. People living in the camps are dependent on water provided by UNHCR and NGO’s. This shortage of clean drinking water causes the usage of contaminated/dirty water for the drinking purposes, which exasperates the healthcare situation in the camps. Rainy season in Uganda spans for around 8 months in a year, however, the rain water is not collected for the usage despite its abundance and minimal requirement of treatment before usage. Keeping in view the situation in camps and an opportunity, we are building a rain water harvesting tool/material KIT that is easily deployable, cheap, and durable and it fits almost every type of house built in the camps. It is also easy to transport during the transition phase as well cheap girls air jordan 10. This kit will be given to the refugees/ IDP on their arrival to the camps. After the design summit, one of the participant, Tobias Bahne took on the project further and did research and prototyping as part of his graduation project at the Bauhaus school of Design. In refugee / IDP camps, aid-agencies typically provide 15-20 liters of water per day per person out of which only 2-3 liters is used for drinking. Providing this quantity of water is expensive and requires a lot of effort. Between 10-20% of this water is wasted due to inefficient usage. This can have a serious health impact. Can we make the utilization of water more efficient for improved health and well being? The team created a simple solution to reduces spillages and recycling waste water while Improving Well being (hygiene, rest, recreation). In this solution a tap and articulation filling arm were designed to be attached to the existing piping system, with a self-opening/closing tap, that requires no contact with hands (potential source of contamination). The original crate used to transport the emergency kit is used as a spillage collector which allows the water to be reused for numerous purposes such as flush latrines and agricultural fields and prevents the formation of a puddle under the taps buy jordans online for cheap. The concept also involves the conversion of water distribution points into communal zones where different water related activities can be carried out such as hygiene, laundry and dishes and a vegetable garden using filtered water. People, especially women and kids, are more vulnerable in the dark and are prone to violent attacks. Services can be inaccessible at night, there may be lack of suitable lighting and areas can be isolated. Darkness can act as a cover for perpetrators, and due to the unsympathetic and hostile nature of authorities/context such incidents of violence can go unreported and unpunished. The team developed a personal portable lighting solution developed to protect the vulnerable in the dark. The LED lamp is attached to a lanyard to be worn around the neck or wrist. It is recharged by a dynamo power supply, and includes a radio for convenience and a panic alarm for protection jordan super.fly. It’s coated in florescent material to make it easy to find, even in the dark, and its magnetic base makes it easy to store or attach to be used as a fixed lamp.